BETTER PRODUCTION Shops Using Technology 114 MMS January 2017 mmsonline.com w e r e a d d e d o n s i m i l a r s o l i d c a r b i d e to o l s , a n d t h e a p p l i c a t i o n w a s r u n a g a i n w i t h a reduced spindle taper interface (HSK 63 instead o f H S K 10 0 ); a l e s s - r i g i d f i v e - a x i s , g e a r- dr i ve n spindle; a nd a le s s-sta ble diagona ll y fixtured workpiece. Despite these additional limiting factors, the tool could process a full slot of 2×D (50 mm) with complete process reliabilit y, Mr. Kirsten says. 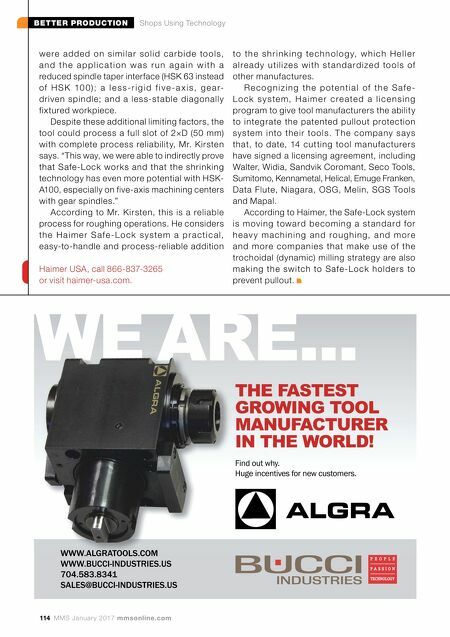 "This way, we were able to indirectly prove that Safe-Lock works and that the shrink ing technology has even more potential with HSK- A100, especially on five-axis machining centers with gear spindles." According to Mr. K irsten, this is a reliable process for roughing operations. He considers t h e H a i m e r S a f e - L o c k s y s te m a p r a c t i c a l , easy-to-handle and process-reliable addition to t h e s h r i n k i n g te c h n o l o g y, w h i c h H e l l e r a l r e a d y u t i l i ze s w i t h s t a n d a r d i ze d to o l s o f other manufactures. 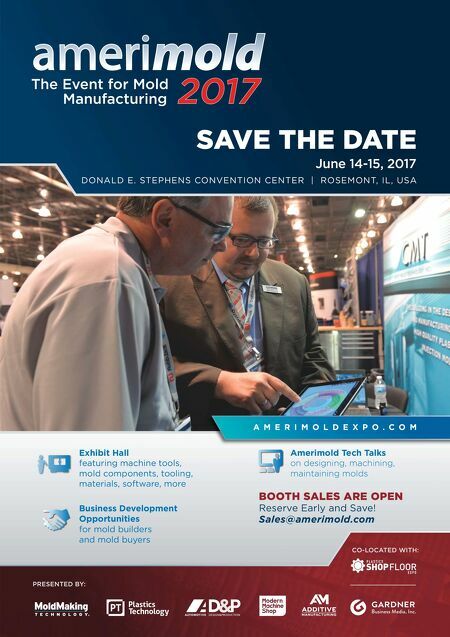 R e c o g n i z i n g t h e p o t e n t i a l o f t h e S a f e - L o c k s y s t e m , H a i m e r c r e a t e d a l i c e n s i n g program to give tool manufacturers the ability to i nte g rate the patented pullout protection sy s te m i n to th e i r to o l s. T h e c o m p a ny s ay s that, to date, 14 cut ting tool manufacture rs have signed a licensing agreement, including Walter, Widia, Sandvik Coromant, Seco Tools, Sumitomo, Kennametal, Helical, Emuge Franken, Data Flute, Niagara, OSG, Melin, SGS Tools and Mapal. According to Haimer, the Safe-Lock system i s m ov i n g towa rd b e c o m i n g a s t a n d a rd fo r h e a v y m a c h i n i n g a n d r o u g h i n g, a n d m o r e a n d m o re c o m p a n i e s th at m a ke u s e of th e trochoidal (dynamic) milling strategy are also m a k i n g th e sw i tc h to S afe - Lo c k h o l d e r s to prevent pullout. Haimer USA, call 866-837-3265 or visit haimer-usa.com.